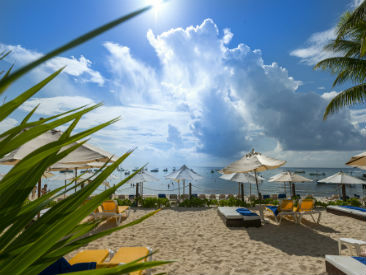 The Reef Coco Beach Resort is a full-service beachfront resort offering a nice variety of on-site facilities and amenities. An unbeatable location within walking distance of downtown Playa del Carmen combined with the beautiful white-sand beach, expansive pool with swim-up bar, five restaurants, a snack bar, four bars, a children's club, tennis court, the Marina Dive Shop offering a variety of non-motorized water sports, bicycles for touring the neighborhood and a fitness center and new Ya'ax Spa promises a laid-back Mayan vacation sure to please anyone! Wireless internet access is available in the lobby area. Plan a tour to some of the area's most popular sites. 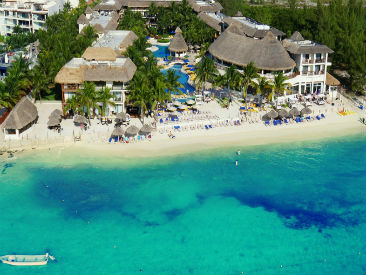 Tres Rios, Playacar's Bird Sanctuary, Xcaret, Xel-Ha and Tulum are all easily accessible. The event staff will provide professional assistance and complete coordination services of everything from special team building programs to amazing private social events, all within a brand new conference facility. 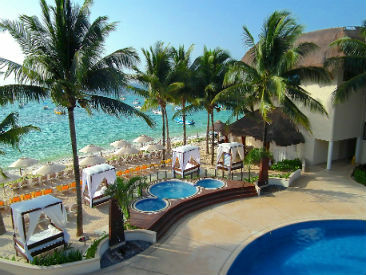 on-site staff provides exceptional attention to every detail including welcoming cocktails and private check-in services. Wi-Fi is available in public areas for a surcharge. Pamper yourself without ever having to leave the resort. Enjoy treatments like massages, facials and so much more! The Reef Coco Beach Resort is the ideal choice for family reunions, sales meetings and conferences of small to medium size. The professional staff will assist in every aspect of planning your event from beginning to end. The Reef Coco Beach offers a large ballroom space that staff will gladly decorate and prepare for your particular event. It is divisible into 4 smaller function rooms if needed. Banquets, seminars, conferences and sales meetings can all be easily and comfortably accommodated. Auditorium with seating for up to 400 people, with full audio visual services (extra charge). Babysitting, wine list, romantic dinners on the beach, lobster dinners, boutique, jewelry shop, lounge beds, wave runners, snorkeling tours, laundry service, medical service, telephone charges, beach massage, Internet service in lobby & wireless Internet in the hotel area, tour desk, airport transfers, car rental.